Even though Your Sister’s Sister is set mostly in the open air of a secluded area of a Puget Sound island, it feels a bit claustrophobic because of the very small cast. There are only three characters who perform 99% of the film’s interactions and there are only so many combinations a screenplay can invent to pair two of them off at any given time. There are long, drawn out conversations which have an improvisational feeling about them and are enjoyable to sit back and watch. Audiences conditioned to expect quick cuts, brief sequences, and pointed dialogue may grow impatient with the extended length of scenes, but for those who relish real situations and characters who take more than a few minutes to develop will enjoy getting to know these people, quirks and all. 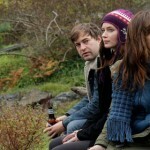 Jack (Mark Duplass) appears, just by looking at him, to be having a rough time. There are bags under his eyes, he has a few extra pounds, probably from too much booze, he is unemployed, and social conversations he attempts to contribute to have a way of ending awkwardly and uncomfortable for all in the room. His brother died a year ago and he still has no idea how to move on from that. 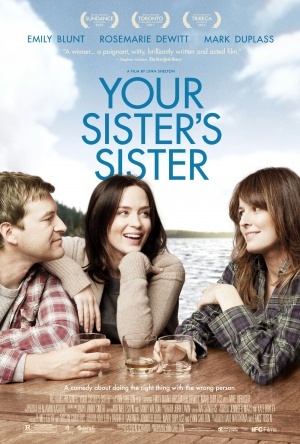 His best friend happens to be his deceased brother’s ex-girlfriend Iris (Emily Blunt). Perhaps this is Jack’s way of hanging on to something his brother once had. Iris cares for Jack and after one of his completely inappropriate diatribes, she orders him to get on his old bike, peddle down to the Seattle ferry, and go spend a week alone in the woods at her father’s cabin. Perhaps some solitude and introspection will kick him out of his funk. The cabin is not empty though. Someone else with life problems decided to squirrel away there; this is Iris’s sister, Hannah (Rosemarie DeWitt). Jack and Hannah recognize a bit of themselves in each other, mainly the self loathing bits, and realize that talking about your problems to a stranger over a bottle of tequila is oddly cathartic. Hannah just walked out of a very long-term relationship with her girlfriend and all of their long-term plans they had together. Both Jack and Hannah are searching for what they should do next in life, where to go, and how to change to get there; so maybe this is why they drunkenly end up in bed together. Your Sister’s Sister sets itself up to go in many directions. It could have been self-destructive depression for Jack. It could have been a modern west coast version of “Walden” for lost souls. However, it chose to become a somewhat comedic love triangle. Iris shows up at the cabin early the next morning and Jack decides she does not need to know what happened last night with Hannah. Each of them maintains their own respective agendas and watching them emerge and conflict with one another is amusing and intriguing to wonder how it may play out. Jack is nervous about the truth being revealed, Iris has her own secrets, and Hannah may be trumping them all. This talk about secrets makes Your Sister’s Sister sound devious and manipulative but it is not; somehow, the script keeps the atmosphere light and airy. Writer/director Lynn Shelton has worked with Mark Duplass previously (“Humpday”) and the summer of 2012 appears to be his emergence to a wider indie public (he has two other films — “Safety Not Guaranteed” and “People Like Us” — in theaters simultaneously). British actress Emily Blunt keeps her accent for this film and the plot noticeably includes a few sentences as to why that is. Her being British is not necessary to the film so waiting to see how they end up explaining away her accent causes a bit of an eye roll but it is not too distracting. Rosemarie DeWitt comes out the winner of the three. She has the benefit of playing the most well written character and she has the acting chops to pull it off. Jack is more the clumsy oaf while Iris is more the sounding board for his issues, but Hannah is in on both of their secrets and therefore benefits screen time wise. 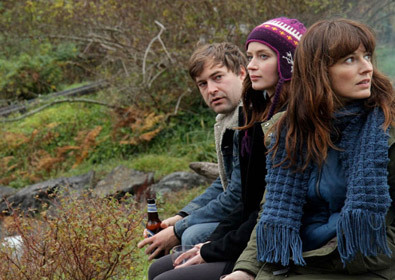 Your Sister’s Sister is much better than its recent cinematic cousin “Safety Not Guaranteed” and aims for more depth in its characters. The film lacks any hard hitting punches which may have catapulted it into more profound waters; however, it is a worthwhile indie film to enjoy in an air conditioned theater on a hot day when the thought of yet another superhero movie will not do.